Monday Night is Track Night (except Bank Holidays and Occasional Hill Training Night). Every Wednesday night is Club Run Night (10k'sh, often with shorter options). Sunday Social runs of 10 miles approx at 10am, plus Marathon Training runs at the weekends especially January to May. PLEASE CHECK our What's on page for fuller details. Our New Members fee is £25.00 This fee includes membership of England Athletics (now £15 for 2018/19 and 2019/20). Membership commences from the day you join and runs until 31st March 2020. The annual renewal date will therefore fall on 1st April 2020 and each 1st April thereafter. Those runners who join in January. February and March 2019 will enjoy membership for the period to 31st March 2019 plus the whole of the following year to 31st March 2020. The benefits of being a registered member of England Athletics are as shown in the section below. The first few times you run with the club there is no obligation to join. Please feel free to come to one of our Club runs and try us out. It is important that the club is suitable for your needs. The membership fee pays for our use of a meeting room, toilets and post run showers. It does not entitle you to membership of any of the Leisure Centre activities such as the weight room or fitness clubs. These are available from the front desk. Second Claim Members fee is £10 per annum. Existing Members pay £22.00 for 2018/19 and 2019/20, includes membership of England Athletics. Lapsed Members returning to ELR will pay £25 which includes EA fee. New to our Club? Please come along to any of our runs/activities and try us out to see if East London Runners is suitable for your running needs. We hold our main Club runs, usually 10k, on Wednesday evenings from Wanstead Leisure Centre at 6.50pm for 7.05pm.Following Club announcements our runs start around 7.20pm. We normally have between 50 and 70 runners participating each Wednesday of varying abilities and speeds of between 6 minute and 12 minute mile pace. Address and Contacts for additional information. Changing rooms, showers, secure room, lockers (£1 returnable), if required. Our current annual membership fee of £22 existing and £25 for new members includes England Athletics membership (£15 for 2018/19 and 2019/20). Once you are a registered athlete you will be sent a competition licence. Along with this you will also receive a username and password which enable you to log in to keep your profile up to date. To go to the 'Edit My Profile' page please click here or go to www.englandathletics.org/editmyprofile. This will help you to get the most from the benefits we are able to offer athletes. With effect from 1st July 2016 Athletes/Club Runners who are not registered with EA cannot represent Affiliated Clubs in EA/UK Athletics licenced races. - Regional and inter-regional championships in partnership with established competition providers. - Representative opportunities for talented athletes at a national and regional level. - Providing athletes with access to support services to improve their training and conditioning. - Working with UK Athletics to bridge the gap between potential and performance. - Working with established bodies to secure more investment for talent development. - Subsidised training events for club members. - Entry benefits for major road races and competitions. England Athletics has been asking people involved in the sport, particularly as athletes, coaches or officials to log in to their England Athletics profile to confirm details including their mailing preferences. This is being done due to important changes in the ways England Athletics has made to how it communicates with the sport and the new General Data Protection Regulations that recently came into effect. This will enable you to receive key information and other information in line with your stated preferences. 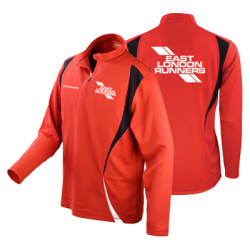 To buy your Club Kit all you need to do is visit http://www.pbteamwear.co.uk and select East London Runners under the Club Shops tab. Please log in/create an account prior to using the voucher remembering to select our Club from the drop down menu. Examples of some of our CLUB KIT that is available are shown below. There are several advantages to this, including the fact that you will be able to buy what you want, when you want it from an extended range of Club Kit. Your orders will be despatched in approximately 5 -15 working days. If there are any stock shortages you will be notified as soon as possible. Please note, kit is not returnable if it doesn't fit. In these circumstances it will be possible to sell on to fellow Club Members assuming that you haven't added your name to it! We strongly recommend you make use of the size charts on the website. The online club shop is best viewed on a PC or Laptop. 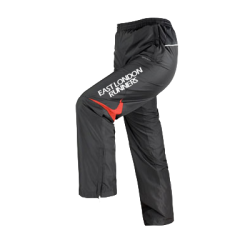 Should you encounter any problems please contact Paul Bailey at PB Teamwear. Preferably by email on paul@pbteamwear.co.uk or on 01709 519101 (10am-4pm Mon-Thur and 10-1 Fri). Made with 100% Coolmax Microfiber with Repel technology ( water just runs off the surface keeping your bandana dryer for longer without any loss of functionality. Seamless Knit. GIRAFFEÂ® 1.3oz and measures approx 50cm x 24.5cm. One size fits all. This item is printed to order. Item comes on a display header card and individually bagged. Seamless tube for maximum comfort. Perfect for the desert, snow capped mountains or just out and about with 30 UPF sun protection. Wicks away moisture when you're hot and keeps you toasty when it's cold. 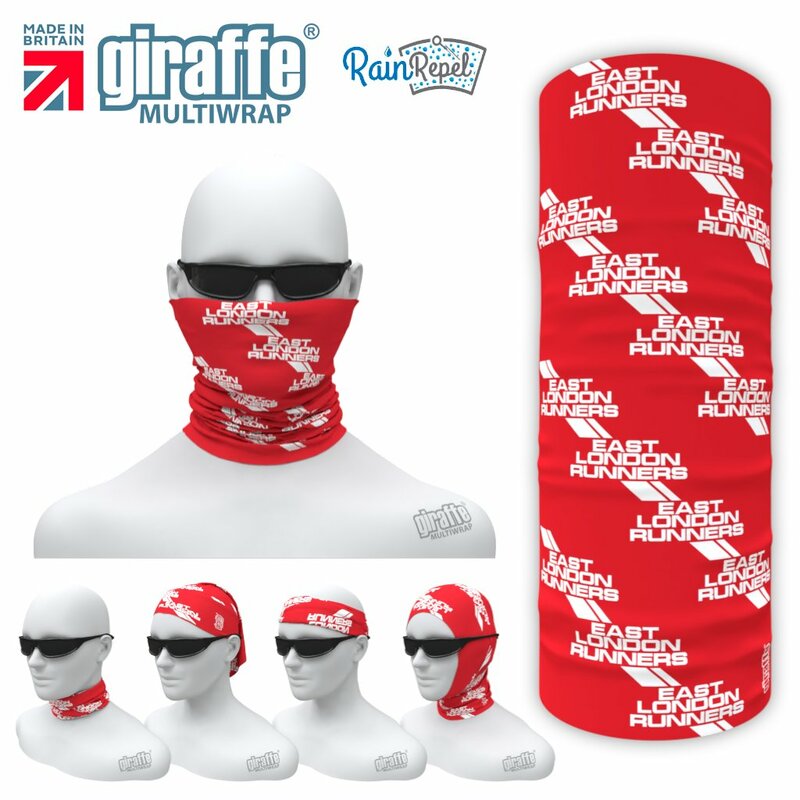 Giraffe boasts extreme versatility and protection. Cover your mouth and nose with your Giraffe bandana to prevent dust and dirt from getting into your lungs. Over 12 ways to wear a Giraffe Bandana. Please check the What's On page of this website or our Group page on Facebook a few days before each activity/run to check that it is on/full details etc. Monday - Track night. See Track Section of this website. Suitable for all levels from beginners to experienced runners. Wednesday - Club Night run from WLC at 7pm, typically 10k in distance (often with shorter options). Suitable for those comfortable running 4 miles plus. Saturday morning parkrun. At 9am FREE timed 5k runs/races at Wanstead Flats (Harrow Road), Valentines Park, Ilford and many other venues across London, the UK and other Countries. 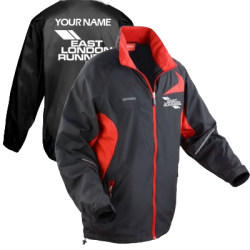 Suitable for all levels from beginners to experienced runners. Sunday mornings Social run- 10 mile'sh Forest runs/ occasional road run. Most often in Epping Forest but sometimes in Hainault Forest. We meet at different locations each week as published on this website and our Group page on Facebook 3 or 4 days in advance. In addition we Race in the ELVIS Grand Prix Series from May to September. ELVIS is a 7 race series of 5k and 5 mile races. Full details on our ELVIS page. Note there is a separate entry fee payable individually for each of the ELVIS Races. Monday - Track night. 6.45pm to 8pm approx. See Track Section of this website. Suitable for all levels from Beginners to experienced runners. Wednesday - Club Night run from Wanstead Leisure Centre at 7pm'sh, typically 10k in distance (often with shorter options). Suitable for those comfortable running 4 miles plus. Sunday mornings Social run at 10am - 10 mile'sh Forest runs/ occasional road run. Most often in Epping Forest but sometimes in Hainault Forest. We meet at different locations each week as published on this website and our Group page on Facebook 3 or 4 days in advance. Saturday/Sunday Morning Marathon Training runs typically from January to April. Distances progress from 10/12 miles to 22/24 miles over time. We normally have around 50 members training for Spring Marathons. Training runs are either organised and publicised by the Club on our News Page and Facebook Group Page. Also Club Members of a similar pace organise ad hoc runs with each other. In addition we Race in the local Chingford League and also in the Sunday Cross Country League from October to March. Full details are on the relevant pages of this Website. These races are free for our Club members. Members can also compete in the County, Regional and National Cross Country Championship races during this period.These races are also free for our Club Members. Already running, experienced or not? See above for details of our normal weekly activities. Q - Are there different levels for the runners on Wednesday and do all run 6 - 7.5 miles or do the distances depend on the level? A - There are often two options, one being the 6 - 7.5 mile and the other 4/5 miles approx. We all run together for the first mile or so, then people go off at their own pace. Don't worry, there are a lot of runners with a wide range of abilities! Also we have back markers to look after the slower runners. A. Shorter runs of up to 5k will be suitable for new runners or those returning from injury or who wish to do a short recovery run. We normally have these from May to September each year. If you feel out of shape, or you're recovering from injury or worried about an existing condition, see your GP before you start running. If you have not been active for a while, you may want to build your fitness levels gently by walking before you move on to running. Running requires very little equipment, but a good pair of running shoes that suit your foot type will reduce the risk of injury. There are many types of trainers on the market, so get advice from a specialist running retailer who will assess your foot and find the right shoe for you.The shoes as shock absorbers weaken over time, increasing your risk of injury. It is advisable to replace running shoes every 300/400 miles. To avoid injury and enjoy the experience, it is essential to ease yourself into running slowly and increase your pace and distance gradually over several outings. Start each run with a gentle warm-up of at least five minutes. This can include quick walking, marching on the spot, knee lifts, side stepping and climbing stairs. Start walking for an amount of time that feels comfortable (anywhere from 10 to 30 minutes). Once you can walk for 30 minutes easily, include some running intervals of one to two minutes into your walking at a speed that feels comfortable. As time goes on, make the running intervals longer, until you're running for 30 minutes continuously. Run with your arms and shoulders relaxed, and elbows bent. Regular running for beginners means getting out at least twice a week. Your running will improve as your body adapts to the consistent training stimulus. It is better to run twice a week, every week, than to run half a dozen times one week and then do no running for the next three weeks. At East London Runners we would recommend that you initially attend our Beginner nights each Wednesday (May to September) and the Monday Evening Track Sessions. Also a good option for development are the Saturday morning parkruns (NOTE parkrun is not part of East London Runners but many of our members join in on their weekly runs which are FREE. Register with parkrun before attending). See below for fuller parkrun details. At the Beginner nights (May to September),track and parkrun you can build your distance and stamina up each week by initially walk/jogging and then develop into running.You can run with us for up to 3 sessions, plus the parkruns, to see if our Club is suitable for your needs and then decide if you wish to join us. If you are new to running or would like to complement your other running/training with track work, then why not come along on a Monday evening and improve your running no end by doing something that no other single training session will better. Beginner Sessions each Wednesday evening (May to September) - Meeting with other Club runners at 6.50pm for 7pm at Wanstead Leisure Centre, we will be also be leading a slower, Beginners Group, running up to 5k. We gladly welcome all abilities, and will cater for all paces. Face your fears and get a feel of how running in a Group is and you'll soon be up to 5 miles in no time. A change in Government legislation regarding data protection called The General Data Protection Regulation (GDPR) will be in place from 25th May 2018. When you become a first claim member of or renew your membership with East London Runners you will automatically be registered as a member of England Athletics. We will provide England Athletics with your personal data which they will use to enable access to an online portal for you (called myAthletics). England Athletics will contact you to invite you to sign into and update your MyAthletics portal (which, amongst other things, allows you to set and amend your privacy settings). If you have any questions about the continuing privacy of your personal data when it is shared with England Athletics, please contact dataprotection@englandathletics.org. At East London Runners we also store the personal data for each member, whether or not first claim, from our membership application form within our own systems on our membership database. 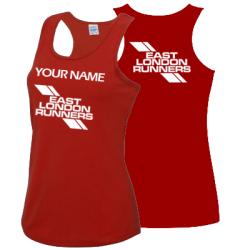 When you become a member of East London Runners, we assume that you consent to your photograph being taken at club events and competitions and that these images my be used on the club website and/or Facebook page. If you object to a photograph that has been published on the above media, please contact us at webmaster@eastlondonrunners.org.uk and it will be removed immediately. Please note that both our Membership Application form and the Code of Conduct section of this website give full details of the conduct that we at East London Runners and also at both England Athletics and UK Athletics expect from our members. Please take time to make yourself aware of these requirements. PLEASE ALSO NOTE - The Code of Conduct applies to our Members use of SOCIAL MEDIA too. e.g. Facebook, Twitter, WhatsApp, Instagram etc. Club Member of United Kingdom Athletics. Club Member of England Athletics. Club Member of The Essex County Amateur Athletic Association. Club Member of South of England Athletic Association. The club has had a long relationship with the London Marathon. We've been involved with organising a drink station in Poplar High Street, around the 20 mile point in the race,jointly with London Fire Brigade in recent years. In addition we manage a Special Drinks Station for Elite Athletes on the Isle of Dogs, currently around the 25k didtance in the race.We always have a number of Club Members, often 30 or more running and training for the London Marathon each year. In addition we will have around 20-30 other Members competing in the other Spring Marathons in Paris, Machester, Brighton etc. The main marathon training takes place from early January each year and there are opportunities to train with other members of a similar standard. With Epping Forest on our doorstep a lot of the training can take place off road.